(0 Customer Reviews) | Write Review 12 issues per year Pole Fishing Plus is the video magazine exclusively for pole anglers! 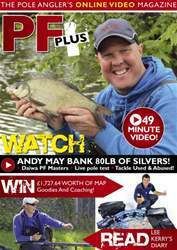 Put together by the team behind the top selling print publication Pole Fishing magazine, Pole Fishing Plus, includes a monthly High Definition video with a top pole angler, as well as a host of exclusive content in a 50+ page online magazine. Edited by Joe Carass, the publication prides itself on bringing you the latest tactics, techniques and methods from the world of pole fishing. Our monthly video, filmed with one of the sports top names, lets you get inside the head of the very best in the business, uncovering tricks and tactics that are sure to catch you more fish! Plus, we have an exclusive monthly diary from England International, Lee Kerry. In this, he runs through his past months fishing, unveiling the edges, tricks and tips that have helped him succeed. If you’re a pole angler, and want to improve your fishing, this really is a publication that you cant afford to miss! 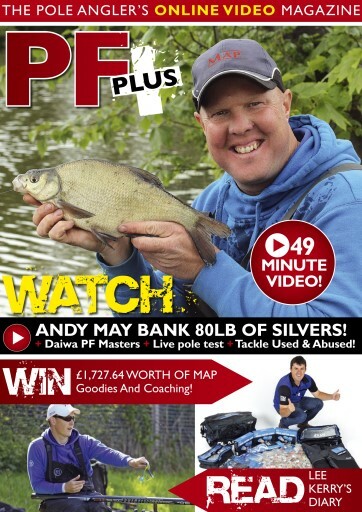 In issue two of Pole Fishing Plus, three-time Kamasan champion Andy May reveals his devastating tactic for catching big nets of commercial silvers. The Pole Fishing team travels to South Yorkshire’s Aston Park Fisheries, and while Andy gets among the venue’s prolific ide population, Matt Godfrey goes in search of carp! Meanwhile, in his exclusive diary, Lee Kerry divulges the tactics that he has used to win the recent Garbolino Lindholme Lakes Festival, and frame in the Daiwa Pole Fishing Masters. Alongside the usual fun and banter, there are also in-depth pole and tackle reviews, and a look back at Pole Fishing’s Tunnel Barn Farm Masters event. Pole Fishing Plus is the video magazine exclusively for pole anglers! Put together by the team behind the top selling print publication Pole Fishing magazine, Pole Fishing Plus, includes a monthly High Definition video with a top pole angler, as well as a host of exclusive content in a 50+ page online magazine. Edited by Joe Carass, the publication prides itself on bringing you the latest tactics, techniques and methods from the world of pole fishing. You'll receive 12 issues during a 1 year Pole Fishing Plus magazine subscription. You'll receive 12 issues during a 1 year Pole Fishing Plus magazine print subscription.